Since 1939, Honolulu Sign Company Limited has been outfitting Hawaii’s businesses with the custom flags, custom labels, and custom decals that they need. From custom stencils, to ready-made stencils, to supplies, they have everything businesses need to build their visibility on the island. Custom flags and plaques can be made in a variety of materials such as redwood, koa, corian, acrylic, marble, neon, tile, and aluminum. From design choices to layout, Honolulu Sign Company Limited will guide your business through the process of creating custom pieces. What you see in your mind’s eye is what Honolulu Sign Company Limited will create for you. In addition to stencils, plaques, and decals, they also have experience with real estate signs, traffics signs, and flag poles. Whether you’re in Oahu, another nearby island, or even the South Pacific, Honolulu Sign Company Limited will take care of your signage needs. 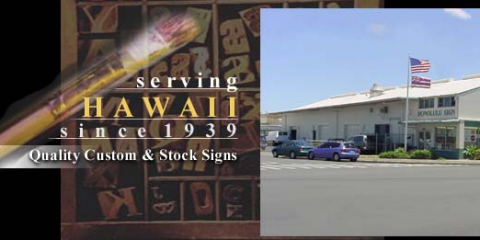 Each product that you buy from Honolulu Sign Company Limited is made with quality materials and with care. Whether you’re a new business or just looking to redesign, plaques, decals and other materials from Honolulu Sign Company Limited will bring your business the attention it deserves. Bringing in new business starts with visibility, and visibility starts with Honolulu Sign Company Limited. Check them out online to see their full product list or call them at (808) 847-4047 to get started.